WWE's Best of Raw: After The Show is out now on DVD and Blu Ray, available from www.wwedvd.co.uk, currently priced at £19.99 for DVD and £22.99 for Blu Ray. The three disc set, looks at the best moments that have happened after Monday Night Raw goes off the air and is presented by Renee Young. The set looks at the period between May 1999 and April 2013 and features some of the biggest names to have featured on Raw during that time, including Shawn Michaels, Chris Jericho, Edge, CM Punk and "Stone Cold" Steve Austin! The Best of Raw: After The Show looks at those moments that happen after WWE's flagship TV Show, Raw goes off the air. These moments usually consist of crowd-pleasing actions and occasionally matches to send the crowd home happy, as the heels have come out on top at the end of the show. I have to say I was fairly excited when the discs for this one came through, as almost all of this footage was completely new to me, which is rare in 2014, especially with the WWE Network opening it's doors earlier this year. There is no commentary on any of the set, which may be a problem for some people. The set is presented by the lovely Renee Young and anyone who follows @ATPWrestling on Twitter will know that I might, perhaps, have a slight crush on Renee (as the majority of the wrestling world it would seem). She does a good enough job, in her nine segue segments throughout the piece, breaking up the action and introducing the next clip well. The first discs contains a total of 11 different segments, with three segues from Young. Proceedings begin with Steve Austin, Triple H and Shane McMahon engaging in an entertaining segment which closed the highest rated episode of Raw in history on 10th May 1999, both Shane McMahon and Triple H return in similar roles, this time featuring The Rock in the next segment from 3rd April 2000. Both are pretty similar in feel, and set up a theme that will continue throughout the sets, expect to hear a lot about Steve Austin and The Rock going forward. The crowd clearly love these moments and pop appropriately, however it is hard to feel that kind of excitement sitting at home with no lead in present. One month later, we get some dancing as Too Cool and Rikishi lead Chris Jericho, Big Show and The Dudleys Boys in their signature dance, after seeing off Triple H once again. The Game is takes a beating again a month later, this time as the hands of Kane, The Undertaker and The Rock, however the highlight of this segment is some terrific mic work from Triple H, who does a great job of winding up the crowd, whilst also being laugh out loud funny at the same time. Oh yeah and Kane delivering the People's Elbow is pretty funky too! We're thrown into the midst of The Invasion angle next, as The Rock quickly dispatches with Booker T, followed up by a hilarious encounter with Shawn Stasiak (Yeah, Shawn Stasiak once closed Raw). In a strange moment from September 2001 (the first Raw following 9/11) we see Rob Van Dam completely obliterate Steve Austin, before a heel Austin closes the show. Austin is fantastic throughout and has the crowd in the palm of his hand, which serves to show the monumental error WWF made by turning him heel. Kurt Angle acts as the perfect stooge for The Rock, in front of Rocky's home town Miama crowd, as The Great One has the crowd reacting to even the slightest movement in a clip from December 2001. Stone Cold is back for a third appearance, this time being aided by Hulk Hogan in despatching the NWO's Scott Hall, Big Show and X-Pac, in a messy brawl. There's a lengthy beer bash, I have to say I found myself switching off after a while. However it's nice to see Hogan actually knew how to drink beer with Stone Cold at some point in time. In what was possibly my favourite segment on the entire set, a whole cast of characters attempt to get The Undertaker to attempt a "Spin-a-Roonie" including a number of Spin-A-Roonies from a number of others. There's some genuinely funny lines from The Rock, Triple H, Mr. McMahon and others throughout and the whole thing does feel like a superb rib on The Undertaker. 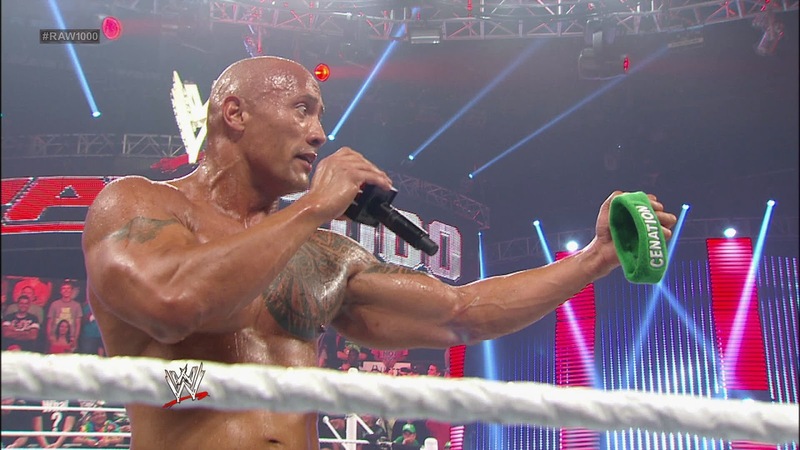 Booker and The Rock are back for the next segment from February 2003 and whilst The Rock is on form on the mic once again, this time in his Hollywood Heel persona, this probably wasn't needed after the previous lengthy segment on the Spin-A-Roonie. In the final segment from Disc 1, Stone Cold and The Rock build towards their final encounter at WrestleMania XIX, with some masterful stalling before the two engage in an enjoyable brawl. Disc Two kicks off the night following WrestleMania XIX, following on from Goldberg's attack on The Rock, as The Rock treats us to a heart warming moment with a young fan at ringside. Goldberg makes an appearance in the next segment, alongside Stone Cold as the pair drink some beer and beat up Eric Bischoff in one of the segments that I imagine would have been a lot of fun for the live crowd, but doesn't particular translate here. What does translate is the Ric Flair celebration from two weeks later, as what looks like the whole looker room, including Vince and Shane McMahon join The Nature Boy in the ring. Flair's emotional promo is a delight to watch. Steve Austin continues to clock up appearances as he gets the crowd to sing "Happy Birthday" to camera man Marty. Marty's subsequent heel turn is amusing, and it's kept fairly short. The beer bashing continues as Stone Cold is joined by Chris Jericho in the next segment from August 2003. This exactly what you'd expect from two of the best mic workers in the business, completely fantastic. The pair seems to have a lot of fun here, and it emanates from the screen as they have the crowd under their spell throughout. Similar to Ric Flair's celebration earlier in the set, The Fabulous Moolah celebrating her 80th Birthday in September 2003, see's a number of superstars out in the ring. There's a cameo appearance from Mark Jindrak and Garrison Cade which is mildly amusing, but overall it probably goes a bit long. The beer bashes begin to get a bit tedious at this point in the set, as another Steve Austin and Goldberg drink session is presented. Austin heading down to the ring on an office chair is funny, but it doesn't really warrant a place on the DVD. The beer continues to be drunk, in a segment from February 2004. This time Austin is joined by Booker T, Rob Van Dam and Mick Foley. This segment goes way, way, way too long (over fourty minutes) and Austin trying to get Lilian Garcia to do a Spin-A-Roonie is uncomfortable to watch. By this point I'd really began to lose interest in this DVD, which should have been renamed "Stone Cold Drinks Some Beer". Disc two finishes up with more beer, as Austin is joined The Rock and Mick Foley, which is luckily kept short, with the three having an entertaining exchange. Disc Three opens up with the first match of the set, as Triple H & Ric Flair team up to face Shawn Michaels & Randy Orton from February 2005. The bout is pretty good, with sound storytelling and some funny spots, that anyone who hasn't been to a live event will be surprised by. If you've ever wanted to see Ric Flair's bare arse this is the match for you. 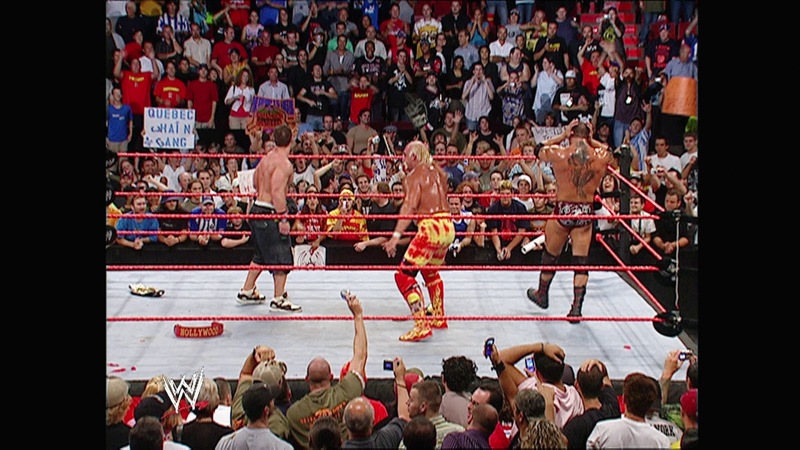 Hulk Hogan returns in John Cena and Batista's first appearance on the set from August 2005 in an inoffensive pose session, that was again was probably more entertaining in person. Cena features in the following segment from January 2006, this time putting over Ric Flair on the microphone in North Carolina, in a touching moment. It's not quite the celebration we saw earlier for Flair, but still a solid addition to the set. Cena completes a trifeca of segments with "San Antonio" Street Fight with then WWE Champion Edge from July 2006. The bout feels more like a PPV main event from that era, rather than a dark match following Raw, lots of nice false finishes that the crowd is really into. A lot of fun to watch. The matches continue as Randy Orton takes on Triple H in August of 2007. After an awkward moment at the beginning of the bout, the match itself is very short, with nothing much of note. We skip more than two years then for afun segment with D-Generation X, John Cena and John Cena Snr, before another big jump to July 2011 presents Street Fight between Cena and CM Punk. The match is shown entirely from the hard camera and the crowd is really quiet throughout, which made it difficult to really get into this one. The finish is cool, but this isn't a patch on the Street Fight between Cena and Edge from earlier on this disc. An appearance from Zack Ryder alongside Triple H is a reminder of just how popular the former was in 2011. The night following WrestleMania 28, we get a decent six man tag pitting Randy Orton, then Intercontinental Champion Big Show and then World Heavyweight Champion Sheamus against Daniel Bryan, Kane and Cody Rhodes. This is notable however for the huge babyface reaction the heel Daniel Bryan recieves throughout, with the crowd pouring scorn on the bout whenever he is not in control. The result then is a strange one. In the same month, a birthday celebration for John Cena, featuring CM Punk, Mr. McMahon and the entire lockeroom singing Happy Birthday is a decent addition, if only for The Great Khali;s hilarious rendition of the song. Cena returns in the following segment, taking place just after Raw 1000, as he and The Rock clean house with the Big Show. It has it's moments but goes on for way too long after Show is taken out. The final piece of action on the disc is taken from the night after WrestleMania 29, as we some "interesting" looking people "Fandangoing", after John Cena cuts a decent, but slightly corny promo. I would've like to see something else end the set personally, but this works well enough. Overall, The Best of Raw: Not on Raw set contains a number of entertaining and humourous moments, that a lot of people will never have seen before. There are also a few decent matches on the final disc, of which Edge and John Cena's Street Fight is the clear leader in terms of quality, followed by the tag bout between Triple H & Ric Flair and Shawn Michaels & Randy Orton. However, there are moments where this set really drags, I love Steve Austin to pieces, but there are way too many Beer Bashes on this set, all of which are essentially the same, and whilst his interactions with others are always a pleasure to watch, I feel we could have left the segments after the interactions were over. I do feel that this set has a lot of filler, and sometimes segments over stay their welcome, I don't really need to see a wrestler shake hands with everyone in the arena, so I'd find myself fast forwarding through those segments. I feel that whilst a lot of the segments included are entertaining, they are much better when viewed on their own, instead of a continuous viewing experience. It's a good one to have on the shelf (especially as the content most likely won't be appearing on the WWE Network) to flick through from time to time, but I wouldn't reccomend watching too many segments in one sitting. Segue 2: Did I Just See That? Segment 6: Stone Cold’s Music City, WWF RAW #434, 17th September 2001. Segment 18: Stone Cold and Goldberg Unite. WWE RAW #545, 3rd November 2003. Segment 21: Hogan Poses with Batista & John Cena. WWE RAW #638, 15th August, 2005. Segment 22: Ric Flair Thanks North Carolina, WWE RAW #661, 23rd January 2006.